I originally wrote this blog as a guest post for Sapphyria’s Book Review. You can see the original post here. As a writer, my inspiration sometimes comes from the familiar. My first story was inspired by my childhood adventures. 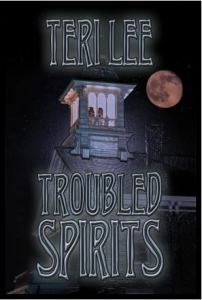 But Troubled Spirits was inspired by something unfamiliar—ghost hunting. A group of my ER co-workers were planning an excursion into one of the older hospital buildings and they invited me to join them. My brain formulated the word no, but what I heard my mouth saying was yes. And in that moment, a seed was planted. The seed which would grow into Troubled Spirits. What if a group of teenagers decided to try their hand at ghost hunting? But what if the ghost didn’t want to be hunted? Although the hospital shot down any possibility of a ghostly excursion into any of their buildings, our little group huddled together in an empty ER room with a spirit box. Not only was that an experience I’ll never forget, it was the inspiration for the scene in the school cafeteria when Logan’s spirit box…. I went back to the internet in search of details, but all I found was this same paragraph on various websites. So I decided to take action. Along with a friend, I jumped into my car and made the two hour trip to investigate in person. We visited the “haunted” school. We visited the library. I searched through books about the town history. Finally, I spoke with the librarian. Yes, he’d heard of the rumors, but assured me they were just that—rumors. But I wasn’t done with my investigation. We visited every cemetery we could find, searching for the gravestones of teenaged boys who died in the 50’s. There were none. Not one! Although I was disappointed that I hadn’t proven the rumor to be true, I’d gathered up bunches of inspiration along the way. I now had a model (adapted slightly) for not only the Caldwell School, but also the library. Because the town which inspired Shady Cove is a coastal town, many of the older gravestones belonged to captains. And these gravestones were the inspiration for the short story found within the pages of Troubled Spirits titled The Captain. What I learned while writing Troubled Spirits is that inspiration can come from any place. Sometimes it comes when you’re not looking and sometimes you need to go looking for it. So be ready. The inspiration for your success might be right in front of you, or waiting for you around the next corner. I’d love to hear about what inspires you!